Imagine if you were to discover Einstein’s notebooks containing his thoughts as he prepared his lectures, papers and experiments. Chances are the finder would be excited to hold in his hand “the master’s” very own words and thoughts, explaining the very laws of nature as he understood them. However, that excitement might well lead to disappointment when rather than a clear explanation of his ideas and thoughts you found a notebook filled with partial equations, and seemingly random thoughts written in a terse and cryptic way. Only someone who understood the material and spent time deciphering those thoughts might be able to help you appreciate the treasure in your hands. Click here for moreIt is the sense of frustration which the novice encounters when he begins to study the Torah commentary of R. Yehudah Aryeh Leib Alter zt”l, the former Gerrer Rebbe who led Gerrer Chasidim in the latter half of the 19th century. A master of Polish Chasidus, R Alter, popularly known as the Sfas Emes after his commentary, was a central figure in Polish Chasidus as he led his Chasidim and created a movement which survives to this day as a major force in Orthodoxy. Centered in Ger, the Rebbe’s tisch was a major focal point of his teaching. Therein he would expound on the weekly parsha or deliver a discourse on the holiday using his unique understanding and insights into the various sources. His notes serve as the source material for his Torah Commentary – the Sfas Emes. These notes are the written legacy of his 35 years as the leader of one of the largest Chasidic groups in Poland. Yet, like the scientist’s notebook, the novice unused to the Rebbe’s thoughts and style is confronted by a terse work, cryptic and at times frustratingly opaque to the reader, especially one unfamiliar with various Chasidic and mystical concepts often mentioned in passing. Dr. Chaim Nosson Leff has attempted to assist the novice in understanding the Sfas Emes. 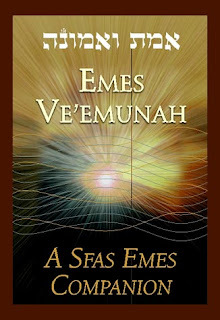 Emes Ve’Emunah is subtitled A Sfas Emes Companion. Dr. Leff has selected various maamarim (homilies) delivered by the Sfas Emes during his 35 year tenure as Gerrer Rebbe. The work contains selections with the original Hebrew text followed by Dr Leff’s elucidation. Both the original and this work are organized in sequence of the weekly Torah parsha, as well as a number of maamarim based on the various holidays. In his elucidation, Dr. Leff does an admirable job in leading the reader through the sometimes complex and intricate steps that the Rebbe took to make his point. The origin of this book stems from a weekly e-mail correspondence/posting by the author going back several years. The original posts can be found at this link under the year 5764. With the exception of Parshas Bereishis, all of the maamarim that I read in Emes Ve’Emunah can be found on the web site. Other than including the Hebrew text in the hardcopy, the author has reproduced the material from the web site nearly verbatim, with only minor editing. This represents a missed opportunity. This work would have been greatly enhanced by some additional material. The author could have included additional maamarim not elucidated on the web site. Furthermore, a great benefit would have been a more expansive introduction. To include additional biographical material and background material. Including a discussion of the Sfas Emes’ approach to Torah commentary in particular or a more general discussion differentiating Chasidic and non-Chasidic approach to Torah text. Notably, Professor Arthur Green, a non-Orthodox rabbi and academician, has also written a synopsis of the Sfas Emes entitled The Language of Truth. He includes a more elaborate discussion of Gerrer Chasidus and its origins and place as it relates to other Chasidic groups such as Kotsk. Professor Green’s work in general, however, is basically a translation of the Sfas Emes with a minimum of commentary. Similar material from an Orthodox perspective would have enhanced this book greatly especially for those whose knowledge of Chasidus is limited. Overall, the book will be welcome to those looking to some classical Chasidic insights into the weekly parsha and Jewish holidays.